The Tun Abdul Razak Research Centre celebrated its 75th anniversary on Monday 28th January 2013 after it was incorporated on 27th January 1938 as the British Rubber Producers' Research Association (BRPRA). 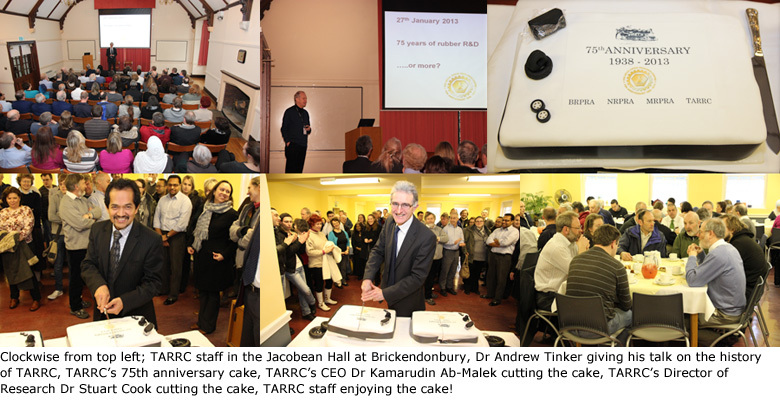 A talk was given to staff at Brickendonbury by Dr Andrew Tinker, TARRC's previous Director of Research, on the 75 year history of the company and its achievements. A cake cutting ceremony was led by the current CEO and Director of Research of TARRC before it was enjoyed by all. TARRC was incorporated on Thursday 27th January 1938 as BRPRA and was established to understand rubber and mount a programme of fundamental research to achieve this aim. The objective was to increase rubber consumption and thereby increase the price of it as a commercial commodity. In those first years of the association pioneering work on rubber and polymer science in general was carried out. This covered areas such as rubber physics and engineering products, rubber chemistry – solution behaviour, vulcanisation, oxidation and new materials from natural rubber, biology and biochemistry – morphology and synthesis and characterisation – analysis of rubber compounds, physical testing and even early development of computers. In 1957, Malaya gained independence and BRPRA became the Natural Rubber Producers’ Research Association (NRPRA). Malaya, which became Malaysia in 1963, was the largest natural rubber producer and the largest source of funding from the research cess, although there were also contributions from other countries. Whilst fundamental work continued, there was a gradual increase in applications-oriented work. In 1963, a book called 'The Chemistry and Physics of Rubber-Like Substances' was edited by Dr Leslie Bateman for the 25th Anniversary. Malaysian producers became the sole source of funding in 1973 so NRPRA became The Malaysian Rubber Producers’ Research Association (MRPRA). The emphasis on applications-oriented work continued to grow. In July 1974, the company moved from Welwyn Garden City to its current premises on the Brickendonbury Estate in Hertford. In 1988, a book called 'Natural Rubber Science and Technology' was edited by Dr Alan Roberts for the 50th Anniversary. Natural rubber production in Malaysia peaked in 1987-1988. From 1990 some funding of the parent body, The Malaysian Rubber Research and Development Board, came from the Malaysian Government. There was increased emphasis on product development and support of the rubber product manufacturers in Malaysia. Therefore MRPRA no longer fully reflected the support or purpose of the Association, which was re-named in 1996 to the The Tun Abdul Razak Research Centre (TARRC). To this day TARRC strives to enhance the competitiveness and viability of the Malaysian rubber industries in the global environment through focused R&D, effective transfer of technology and quality support services. TARRC’s scientific and engineering excellence is focused towards the advancement of the Malaysian rubber industry through compounding and processing, materials and product development, engineering design, evaluation and testing and production technology. TARRC’s participation in international exhibitions, seminars and conferences promotes Malaysian manufacturers as leading worldwide suppliers of rubber products and materials.